Japan, 1603. The art of Kabuki Theater begins - and it is something that has never been seen before. Actors emerge onto a stage with painted faces which indicate who their character is. Their movements are so graceful that often the viewer cannot distinguish which movements are dance forms and which are the acting. Actors train for years to be able to possess the honor of being in a public performance. It is as if you are learning an entirely new language - the stylized motions convey the emotions that the heart speaks and the mouth has no words for. Japan, 2015. 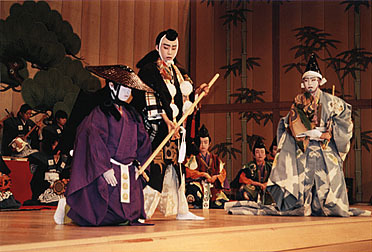 A Kabuki Theater performance is staged. Actors and actresses perform, pride showing in their actions. They have trained for year for this. Not to shine as theater stars themselves, but to accurately portray the Kabuki performance the same way the actors before them did. A Kabuki performance stands frozen in time - performed the same way over and over again. The performance given in 2015 is the same performance one saw in 1615. There is great pride in the preservation of the traditional Japanese theater - the actor who plays the part of a great hero says the same words, does the very same actions and wears the very same costume design that the original master actor said, did and wore. The Last Supper, 33. While they were eating, Jesus took bread, and when he had given thanks, he broke it and gave it to his disciples, saying, "Take and eat; this is my body." Then he took the cup and when had given thanks, he gave it to them, saying, "Drink from it, all of you. This is my blood of the covenant, which is poured out for many for the forgiveness of sins. I tell you, I will not drink from the fruit of the vine from now on until the day when I drink it new with you in my Father's kingdom." (Matthew 26:26-30). Mass on the First Sunday of Lent, 2015. The priest leans over the host, elevates it and says, "Take this, all of you, and eat of it, for this is my body which will be given up for you." And taking the wine, he says, "Take this, all of you, and drink from it, for this is the chalice of my blood. The blood of the new and eternal covenant, which will be poured out for you and for many for the forgiveness of sins. Do this in memory of me." As Catholics, we gather in Church and are able to participate in the same sacrifice that occurred 2,000 years ago on Calvary. Yet our journey does not start by the foot of the cross. Through the Mass we also are able to experience Christ as we are seated at His Last Supper, and then, (spoiler, my favorite part of the Mass) we join our voices with the angels and saints as we sing in adoration to a God who rose and is in Heaven. The Mass is not simply a performance or a ritual performed the same way and preserved for over two thousand years. The words of consecration are not recited lines said by a priest who wants to be the best priest on the altar since Christ. Instead, they are Christ's words, spoken by a man who stands in the person of Christ. In Luke 10:16, Christ tells his priests that "He who hears you, hears me, and he who rejects you rejects me." The words "This is my body" does not come from the priest who stands in front of us. We are not called to eat the flesh of Father fill-in-the-blank and drink his blood. Instead, the priest acts as another Christ - in persona Christi. The Catechism of the Catholic Church explains this belief as such: It is the same priest, Christ Jesus, whose sacred person, his minister truly represents. Now the minister, by reason of the sacerdotal consecration, which he has received, is truly made like to the high priests, and possess the authority to act in the power and place of the person of Christ Himself." It is not simply a rote rehearsal of words to make sure that we get everything "just right" and preserve the perfect tradition the way Christ would have liked it if he were still here. Rather, HE is still here, in the very real way through His physical presence on the altar. It is also not a simple show, costumes included, of bravado and strict and regulated art. The priest does not 'dress up' as Christ and carry on actions as to imitate him. Rather, he puts on Christ Himself. Rather, even the vestments of the priests symbolize this participation in the person hood of Christ. Pope Emeritus Benedict XVI said, "The fact that we are standing at the altar clad in liturgical vestments must make it clearly visible to those present that we are there "in the person of an Other". Just as in the course of time priestly vestments developed, they are a profound symbolic expression of what the priesthood means...the essence of the priestly ministry, interpreting the liturgical vestments themselves..."
And then we lay people get to participate in that same sacrifice of Calvary on the altar and receive the body and blood of Christ, crucified and risen, into our bodies through the hands of the priest. How beautiful! To be given the actual body of Christ through the hands of His priest, who stands in as another Christ. Saint John Vianney, patron saints of priests, wrote, ""When you see the priest, think of our Lord Jesus Christ." Saint John Chrysostom, a doctor of the Church, said in 391 AD, "Neither angel nor archangel is able to do anything in respect to what is given by God; rather Father and Son and Holy Spirit manage it all; but the priest lends his own tongue and presents his own hand." There is great beauty in the priest acting in the person of Christ - and the beauty of interacting with the God of the Heavens and Creator of the Universe in such a physical way. And while priests are given the honor of such an intimate way do not forget the fact that we too are asked to share in Christ's life here on earth. In Paul's letter to the Ephesians chapter five, he wrote, "Follow God's example, therefore, as dearly loved children. Walk in the way of love, just as Christ loved us and gave Himself up for us as a fragrant offering and sacrifice to God." Act as Christ in your world. Not as an actor, whose life after he is done impressing people returns to it's state of normalcy or even discontented malice. Instead, let Christ invade your live and take over so that we can say like Paul in his letter to the Galatians , "I have been crucified with Christ and I no longer live, but Christ lives in me. The life I live in the body, I live by faith in the Son of God, who loved me and gave himself for me."